Chainsaw carving is a skill with a steadily growing band of devotees in the UK. It has been very popular in the USA for quite some time now as anyone browsing on the Internet will realize on encountering the large number of websites advertising the wares of the various artists operating there. I had been reliably informed by one of my friends Ed Robinson, who was a veteran of the art, that it started off in the UK back in the late 1960s (unfortunately Ed has now passed on). It's popularity faded for a while, though seems to be making a bit of a comeback in recent times (Ed writes articles for the "Forestry Machine Journal" and operates from his home in NE England). This seems to be largely due to the growth in the ranks of chainsaw operatives working in forestry and tree surgery who are desperately looking for other ways of earning a decent living in this present climate of low timber prices and increasing competition in the arboriculture industry. There is also a growing awareness of the chainsaw's potential in removing lots of wood very quickly amongst the ranks of art students with an interest in woodsculpture, and the more established, recognized, skilled woodcarvers. I have run a few chainsaw carving courses over the last few years for individuals interested in its potential for earning a little bit of money from making something from a resource that would otherwise have become firewood. Those involved have amazed me with their determination to learn and develop the skill. 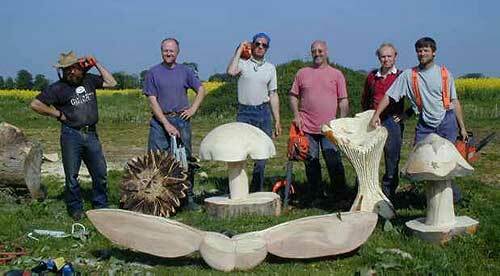 Here is a picture of some of the cheery students, with their creations, on the Summer 2001 chainsaw carving course. Unfortunately, as the demand for my skill as a carver has increased, I am no longer able to find the time to run carving courses. There are quite a few large scale woodcarvers dotted about up and down the country (UK). They seem to originate from two distinctly different backgrounds. There are those who became involved with woodcarving as a pastime or as a medium in which to work as part of a course related to art - usually having worked in smaller scales exclusively with hand tools, then moving up in scale, til it became necessary to use serious power tools in order to remove a lot of wood within a realistic time frame. Most from this background will use the chainsaw for major roughing out, then quickly fall back on other power and hand tools aiming for a detailed, fine finish. The time taken to finish a piece can run into several weeks on occasions. Then there are those who learned to use a chainsaw as part of their job in forestry or tree surgery type businesses. These people have, as a rule, become very used to the handling of chainsaws. They are more inclined to use the chainsaw from beginning to end on a sculpture. Often producing what amounts to a sketch in wood (some of them very accomplished, detailed sketches). The only other tool kept in the "armoury" is usually a power sander. The finishing time for these sculptures is typically hours, or, going on to a few days. Between these two we have people with a foot in both camps. I, for instance, have a background in forestry, but I was carving long before I ever picked up a chainsaw. My personal quest is to take as much of the hard slog out of large scale carving as I possibly can by using a variety of power tools. This helps to bring down the costs of a range of carvings and make them more accessible to the public at large whilst at the same time enabling me to feed, clothe and house myself. This is the spirit in which I have put together the following pages. I hope they will be helpful to both the novice and the current carver alike. I am especially concerned that anyone considering using a chainsaw is fully aware of the dangers of the machine and will take up my advice on receiving adequate training in their use. There may be alternative ways of removing large amounts of timber quickly that do not involve the use of the chainsaw.